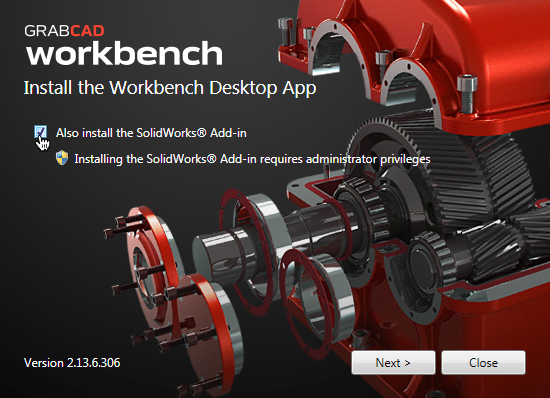 The Workbench Desktop App comes packaged with the add-in if you have SolidWorks on your computer when you install it. Open project on Workbench - Opens the Workbench web interface in your default browser where you can make project actions, such as manage collaborators or update Partner Spaces. Download - Shows the list of pending changes waited to be downloaded. You can click "Download" again to begin the download. If you have conflicting changes, see here to learn how to resolve them. Open local folder - Opens the linked project folder in a Windows Explorer window. Upload changes - Shows the list of pending changes waited to be uploaded. Enter an upload comment and click "Upload" again to begin the upload. If you have conflicting changes, see here to learn how to resolve them. Note: only saved changes can be uploaded. Hit File > Save to see your changes here. New Connection - Creates a new manual connection. 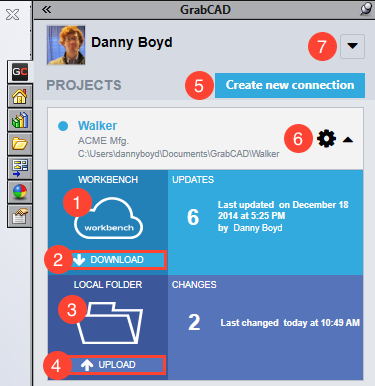 To connect a project to a folder in your GrabCAD folder, please use the standalone Workbench Desktop App. Refresh connection - Checks the local folder and Workbench project for updates. Connections should refresh automatically when there are changes, but in certain cases changes are not recognized unless the connection is manually refreshed, such as if the connected folder is on a network drive. Delete connection - Only available on manually connected projects, this will disconnect the linked local folder. Options - Opens the Options menu for the GrabCAD add-in. See below. Logout - Logs the current user out of the add-in. Update Workbench - Available if there is a new version of Workbench available to download. 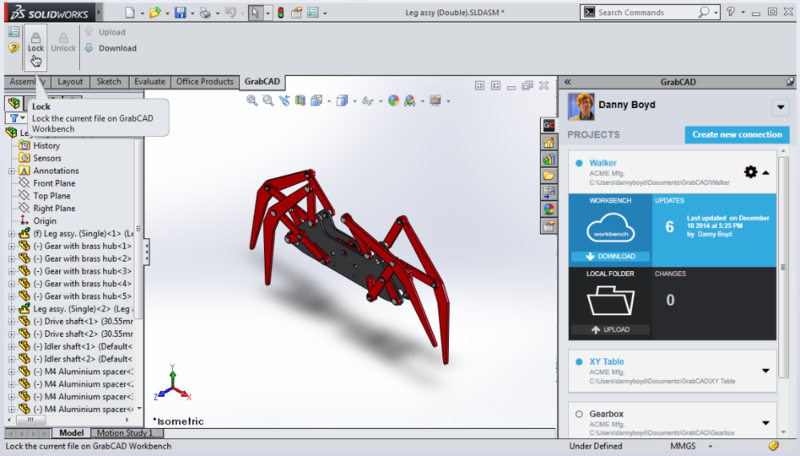 For best results, close SolidWorks, update using the standalone Workbench Desktop App, then restart SolidWorks. I Wish... - Allows the user to send a message to GrabCAD's support team. Use this functionality to request features or report issues. Home - Exits the Download or Upload screens. Send logs - Sends a log of your Workbench actions to our support team. About - Lets you know which version of GrabCAD you have installed. Lock - Allows you to lock the file being viewed if it is managed by Workbench. Unlock - Allows you to unlock the file being viewed. If the file was locked by your teammate, you will be prompted to add a comment explaining why you are unlocking the file. Upload - Brings you to the upload panel in the Task Pane for the project containing the file being viewed if there are pending changes to upload. Download - Brings you to the download panel in the Task Pane for the project containing the file being viewed if there are pending changes to download. The add-in will notify you about information pertaining to the file currently being viewed. ...have been locked by a collaborator. Click the lock button to unlock the file if necessary. ...have been modified locally but not locked. Click the lock button to lock the file and dismiss the message. ...have new versions available to download. Click the blue cloud to go to the download screen. ...are in a folder locally that is not connected to a Workbench project. (Components of assembly only) Click "Details" for more information. 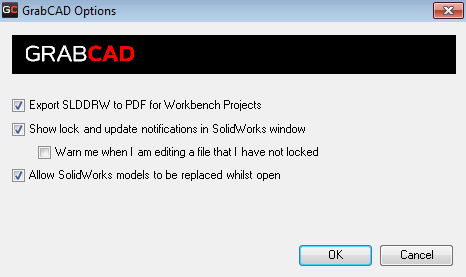 Allow SolidWorks models to be replaced whilst open - When an overlay notification lets you know that there are new versions of the file or components available to download, this setting allows the model to instantly refresh after downloading the new versions. Without this setting, you will need to hit "rebuild" after downloading new versions to see the changes.